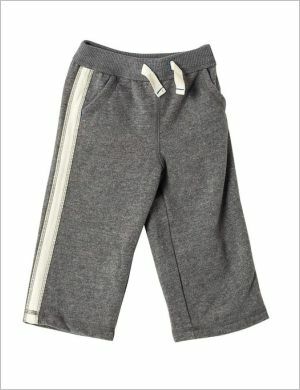 Toddler sweatpants are ideal for toddlers when it’s too cool, in or out, to merit shorts. They’re comfy, cozy, and they wash well. They allow our toddlers to stay warm, but not too warm, and they are flexible and encourage our toddlers to be healthily active. You may use it as everyday house clothes during the fall and winter, and for causal outings when you want your toddler to be comfortable. They are especially suitable for a just-potty-trained toddler; they are much easier to take on and off then, say, a pair of slacks; and they tend to an economical option if you need to buy in quantity. During those first potty training days there may be times when your toddler needs a change of clothes every hour, and a large collection of comfy sweatpants are ideal for getting you through that. Straight leg sweatpants with no elastic cuffs, styled similarly to yoga pants. Here we’ll look at some of the best in both categories. Rabbit Skins and Hanes Sweatpants for toddlers are both comfortable, warm sweatpants in a traditional roomy-leg style, with elastic at the waist and the ankles. Since the ankle elastic will keep the pants from going down over your toddler’s feet and getting dirty, you may want to order large; a generous sizing is often a good idea with sweatpants. Unless your house is super-clean, choose colors that don’t’ show dirt immediately: after all, you want your toddler to be able to play in them without worrying about getting dirty. 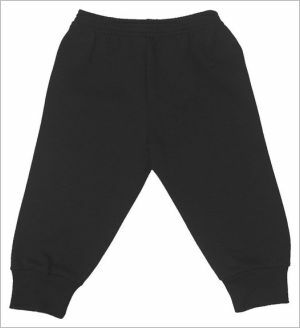 If your toddler wants pockets, or if you want a more tailored appearance, Cherokee Sweatpants are sweatpants for your little guy that have a straighter leg and no elastic cuffs. With two pockets in front and two in back, your toddler will have plenty of room to store his treasures. These pants have a drawstring but also elastic at the waist. They tend to run long; if your toddler is tall, they’ll be perfect, if you have a short child, you may end up putting in cuffs. What about for the little girls? All of the above options work well for either boys or girls, although Hanes sweatpants are billed as ‘boys’. The colors are neutral, as is the cut. But if you want something girly for your little princess you do have other options. Like Carhartt Girls Brush Fleece Pants: warm sweatpants in a cotton/polyester brushed fleece. These are essentially straight leg, but with a more girly cut, and they’ve got a drawstring at the waist. Color options are rosebud, hollyhock, or royal blue colors, and a little glitter along the side adds a sparkle.These pants are very soft and warm, and they are easy to wash and pile-resistant. You can buy a matching hooded sweatshirt to go with them.